Izaline Calister was born into that sunniest part of the Dutch kingdom called Curaçao. In this tropical paradise, most everything is a mix of influences. The people themselves stem from all over the world, with many of their ancestors taken to the island by Dutch slave handlers just as was the case with many of the other Caribbean islands. This mixing of races continues to today. The language of the island is Papiamento, a mix of Spanish, Portuguese, Dutch and English. Likewise, the local food is a blend. Mixtures of Indonesian and Chinese food adapt to the local produce and other influences to make the local cuisine heavy and hearty. Main dishes such as fried fish, stewed kabritu goat, chicken and beef are served with aros moro peas & rice, potatoes or funchi, a boiled cornmeal paste that resembles polenta. Mixed with beans and sugar, funchi becomes tutu. For the adventurous, there is stewed yuana iguana which tastes remarkably like chicken. Due to the poor soil conditions, vegetables usually play a secondary role in traditional Curaçao cooking although there are some notable exceptions. Green papaya, local kònkòmber cucumbers or cabbage are stewed with corned beef. Yambo okra and kadushi cactus form slimy soups for what's definitely an acquired taste. Fried plantains are a popular side dish and also made into a sweet soup with vegetables and seasoned with peppers and cinnamon. Small colorful promèntè hot peppers and pickled onions add spice to local dishes. And of course the music of the island is another great blend of styles and origins. All this mixing and blending is called Creole. In Papiamento, that translates to Krioyo, the title of today's album. Curaçao is rich in all these flavors but does lack schools. That's the reason almost all young islanders transition to Holland to finish their education, with the very musical Izaline ending up in Groningen for her BA studies to soon enter the club circuit while singing to her heart's contend. This made music more important day after day and eventually cemented Izaline's decision to switch studies in favor of the conservatory. To her own roots music, she began adding Brazilian and Jazz both to her repertoire and personal style. Izaline's big break came when Angelique Kidjo left Jasper van't Hof's world fusion band Pili Pili. After some time with Pili Pili, the band Dissidenten welcomed Izaline's omnivorous musical talent. She also released a few solo CDs with mainly Jazzy material. 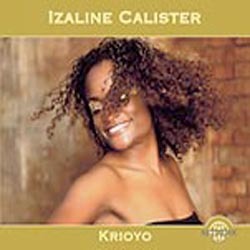 Her latest release Krioyo is a collection of 12 original songs with self-penned lyrics. The Network label allowed Izaline complete artistic freedom to produce the album herself. The result? How about those danza rhythms in a marimbula style of the opening track that take you straight to Africa, with its various percussion instruments leading to the contribution of a string quartet and an exciting but eclectic mix? The second track leads you from its Franco-Caribbean zouk style with background chorus and string support to the Congolese soukous of the next. Izaline's voice is filled with joyous emotions and a very distinctive color. She is able to begin slow and tender and then reach out in powerful crescendos. The lyrics are all in Papiamento and add to the warm overall atmosphere. Dance rhythms vary from a slow waltz to the more percussive tumba, similar to the rhythm used in carnival parades. The typical Pili Pili style of staccato unisons also finds its way into the album and in glimpses but now appears yet funkier due to the unusual string additions. The CD ends with a tambu of percussion instruments made from various metal farming tools and a chapi hoe that is dipped in and out of a water bucket to make it sing when struck. All in all, Krioyo is a very welcome album with great music that is wonderfully recorded by Paul Power.